A superior collection of premium cured meats, award winning artisan cheeses and gourmet pairings are presented in this picnic hamper, complete with a leather handle and an interior zipper insulation system, perfect for transporting hot or cold foods and beverages. Smoked Salmon, Spanish Fermin Lomo Serra and Gouda Cheese. Beemster Vlaskaas Cheese, Sartori Asiago, Artisan Crackers. Green Olives, Dijon Mustard, Tuscan Herb Salami, and more. Your gift will leave a lasting impression as they continue to use and enjoy this elegant picnic hamper complete with a leather handle and an interior zipper insulation system, perfect for transporting hot or cold foods and beverages. $50 Retail Value. Measures 16" x 11" x 12". Award-winning Sartori Basil & Olive Oil Asiago, with six months of careful aging, and hand-rubbed to perfection. The recipient of Wisconsin State Fair's Silver Medal in 2010 and 2008, and the 2010 World Cheese Awards Bronze Metal in 2010. Award-winning Weinrich's 70% Dark Chocolate: The finest German chocolates since 1895, recipient of the Gold Medal from the German Agricultural Society (DLG). Select Charcuterie and Gourmet Cheese Hamper is a hand delivered gift. These gifts are delivered by one of our local design centers located throughout the United States and Canada. Same day delivery is available for most gifts when ordered before the cutoff time. 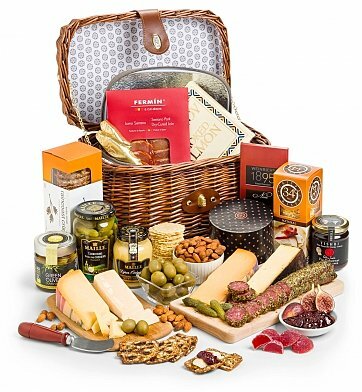 The cutoff time for Select Charcuterie and Gourmet Cheese Hamper is 1 PM in the recipient's time zone. Green olives, cornichons, French mustard and artisan crackers. Arrives in GiftTree signature insulated picnic hamper. Placed and order fo m Australia to my daughter in Colorado Springs, a new house in a new estate with an address still not showing up, Gift Tree went out of their way to find her and keep me up dated. Can?? ?t go past sensational service that included a beautiful hamper. Thank you Gift Tree. Fabulous surprise. Overflowing with gourmet delights! My friend is a retired veteran on a fixed income. I wanted to send her something special. Something gourmet. She said everything was gorgeous. There were so many items she had never even heard of before. She loved trying these gourmet delights. Delivery was perfect. I can't wait to order again for one of my friends and I'm going to order something for myself next birthday! Couldn't have been better. And the basket is a very nice bonus! Our clients are in the middle of a move. Knowing how stressful moving can be, we like to send snacks for them to have on hand during their packing. These clients were completely thrilled. They suggested they are saving it for moving day.....and they will have the fanciest picnic ever! A win. The recipients of this gift were overwhelmed by the selection and quality of the items inside - and are excited to share their bounty with friends. The only negative comment is that the insulation and cooling packs were not sufficient for delivery in Arizona (even though it was only March). The cooling packs were warm by the time the package arrived (and the recipients were home when they delivered it so it hadn't been sitting out). Overall great selection and gift, but packing options could be improved. The selections are gourmet, high quality and everyone was fighting over who got the hamper! This is our go-to gift when we want to let someone know that they are special. My wife received this gift from a friend who chose to remain anonymous. What a spectacular gift for a person who knows her better than most. Gourmet meats, cheeses, jams, date crackers, etc??? Plus when all the food is gone we are still left with a lovely picnic basket with leather strap to use for a Polo match or perhaps just a drive in the country. Even though I have not yet bought anything from GiftTree, they just might be my favorite online retailer find of 2014. Delivery was efficient, even though it was to a business address which is in a difficult area for parking (5th avenue, NYC). The gift arrived on time, and was beautifully presented. The recipient was thrilled! I got this for my wife for Mother's Day. She loved the basket and so far every product that she has tried in it was delicious. My clients received this basket with great excitement. They suggested it was gorgeous (I did not see it). The appreciated the overwhelming generosity that the basket conveyed. Another happy recipient. I ordered this hamper from Russia for my husband's Birthday. He was absolutely delighted. Hamper itself is highquality, nicelooking and lovely. Products are well packed with icepacks and all of them looked tasty! Thank you very much GftTree!